Questions. There were a lot of questions from the first day of class all the way through the last day of class. Addictions, both substance-related and behavioral addictions, and social support were among the topics of discussion and study during the Addictions Recovery Ministry course during the January term (J-term) class at Wesley Theological Seminary. Questions: they flew fast starting on the first day of class. Students were taken aback by the responses of the opening group exercise. The class was asked to list 5 characteristics of an addict or an alcoholic. Addiction behaviors and appearances were listed; however, the small groups neglected to remember persons with addiction are also children of God. It set the tone for the remaining two weeks of class, indicating the stigma individuals with addiction issues face, even in the life of the church. Questions: they came from the diverse group of students, even though most in this pastoral care and counseling course had some exposure or personal experience with addiction. The course provided an overview of the bio-psycho-socio-spiritual aspects of addiction, which included understanding of it as a chronic disease. Ways to provide care for families, crisis counseling, an overview of mental illness, pastoral boundaries, administering Narcan (for overdoses), suicide prevention, and other practicalities comprised much of the course study. Angela Neal, one of the students, said, “I now have a better understanding of what someone in recovery will need in order to be successful.” A comprehensive overview of treatment and support, one that encompassed ways to provide pastoral care for a person’s continuum of care on the road to abstinence or recovery was the path of the course, said Rev. Leo Yates, Jr., the professor of the course. “It’s difficult to jump into church programming if the pastor or church leader doesn’t have the background knowledge of addiction and the different levels of care/treatment, including aftercare,” said Yates, a licensed clinician under an episcopal appointment as a behavioral health specialist at a Maryland agency. As a result, Jeremy Means-Koss, an Episcopalian student serving as a student intern at Emmanuel United Methodist Church in Laurel, MD, learned the importance of spiritual direction and formation, not only for the person and family in recovery, but for the congregation as well. Deepening self-awareness was a significant part of the course that fostered theological conversations, not only to move away from the denial that persons with addictions and their families often face, but to encourage ministry leaders to recognize triggers, biases, and potential burnout. The complementary side of self-awareness is that it can assist persons to be attuned to God’s presence, to be more receptive to guidance from the Spirit for Christian service and to improve self-care. Corey Beauford, a licensed social worker and student from The AME Church said it this way, “From a Christian perspective, I’ve learned – and I must keep this in mind – that Christ is a redeemer and in him, we are new creations.” Recovery is indeed possible. Part of the learning process and course study focused on how individuals, including clergy, are susceptible to addiction problems. The class heard from an anonymous guest speaker, who shared struggles of a behavioral addiction and how recovery is more likely with social support, some of which can be from the church. In addition, Yates shared his own recovery story, highlighting the need for mercy and grace for persons struggling with addiction, including their families. Both shared that 12 Step participation works well with church support, but sometimes shame and judgement from others holds persons back from being forthcoming with their pastors and church family. In the journey to understanding support, the class learned that Alcoholics Anonymous and Narcotics Anonymous, both of which are 12 Step type groups, typically do a better job of welcoming individuals with addiction than churches do. Churches sometimes shy away from being involved because of uncertainty or distrust, perhaps even feeling overwhelmed with some of the needs persons and families may face. Once we move away from judgment and fear, we can offer grace and care in the form of ministry programs. It’s important for us to remember that those of us who have more hope have a Christian responsibility to share it. 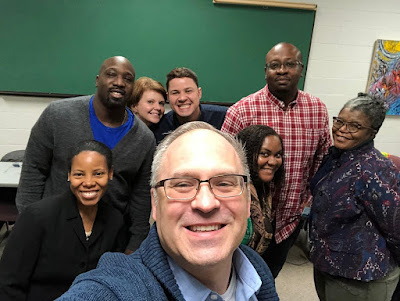 As a part of their coursework, each student developed a ministry program proposal for their present or future church to consider, which included receiving feedback from their fellow students. This way students are ready to bring, for some, life changing opportunities and support to their churches and communities. Most pastors are not addictions counselors, but we can share in the human service work and/or lead others in doing so, said Marci Matthews, the daughter of Bishop Marcus Matthews, who was one of the students. If we are not recognizing the signs and struggles of addiction in our parishes, then we are not wanting to see it. One could argue that we are turning our back on Christ himself (e.g., Matthew 25:35). Christian witness is a part of addictions recovery ministry, yet Christian service comes in many forms and fashion, such as doing prevention education with youth groups, sharing space for 12 Step meetings, offering annual overdose prevention trainings for the community, even adopting a recovery house (a sober living environment) that supports others through friendship and prayer (students were introduced to 35 ministry programs). Accompanying this was the importance of accessibility to church programs for persons with disabilities, in particular Deaf and hard of hearing persons. Students learned sign phrases (e.g., “Hello. Welcome.”) and how churches can be welcoming to people with disabilities and Deaf and hard of hearing people. The need is there. The struggle is real. Thankfully, Christ’s presence is too, and we all can help shine His light in places of darkness. This is incredible! The Church is the best alternative for addicts and thank you for such a profound course. I am interested in deepening my understanding in this area as I am working with over 400 addicts in Liberia.